Been awhile since I did a fashion related post!! 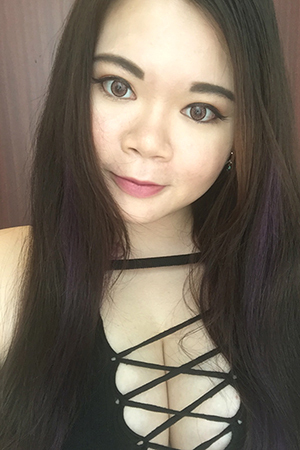 I was approached by Okdgg.com some time back and got the chance to review some fashion loots I chosen from one of their sites, Miss Candy Kr! Okdgg.com is a one stop Korean shopping site! You can find not only fashion pieces but also beauty products and many more!!! With many brands under them, you don’t have to look elsewhere! I was pleasantly surprised as the quality of the clothing are really good and all except one are made in Korea. As of all online shopping experience, there bound to be one piece that is a disappointment. 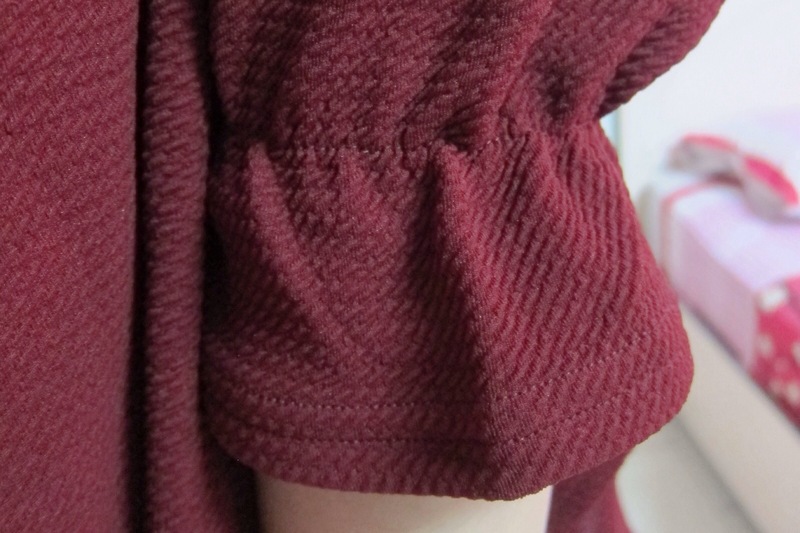 One of the dress I got, is not what I expected mainly on the material. But luckily, it’s only 1 out of 6! The thing about online shopping is that the size might not fit, especially when it’s stated free size. This is often luck when you place the order to see if it will eventually fit. 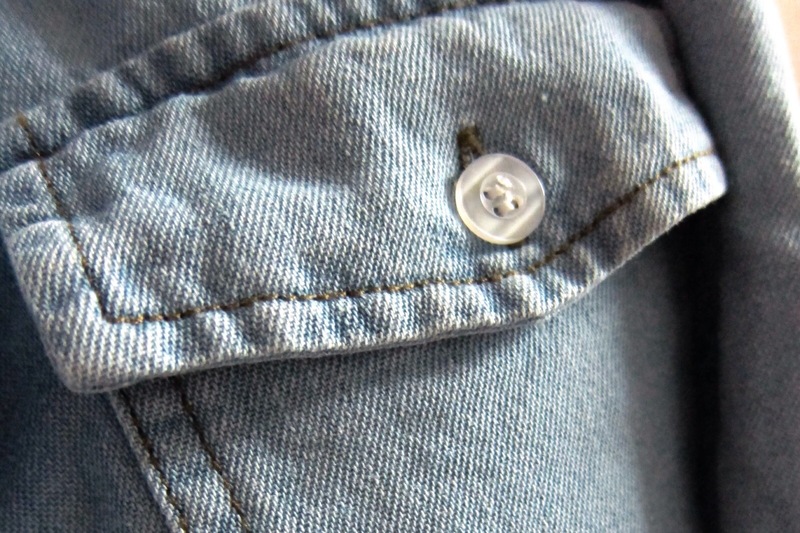 This denim fits but it’s a little tight at the upper arms. It’s a waste to just out it aside as I really like the material. 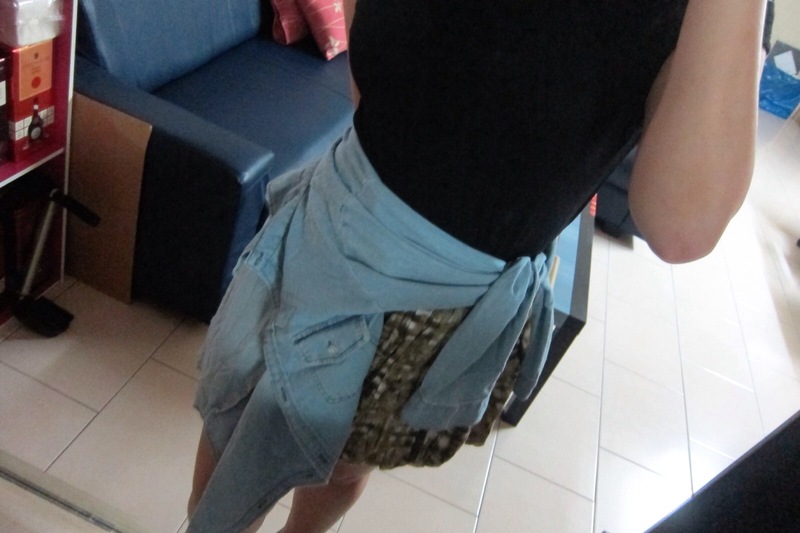 Hence, I decided to wear it as an off shoulder jacket or around the waist to spice up my otherwise normal outfit. 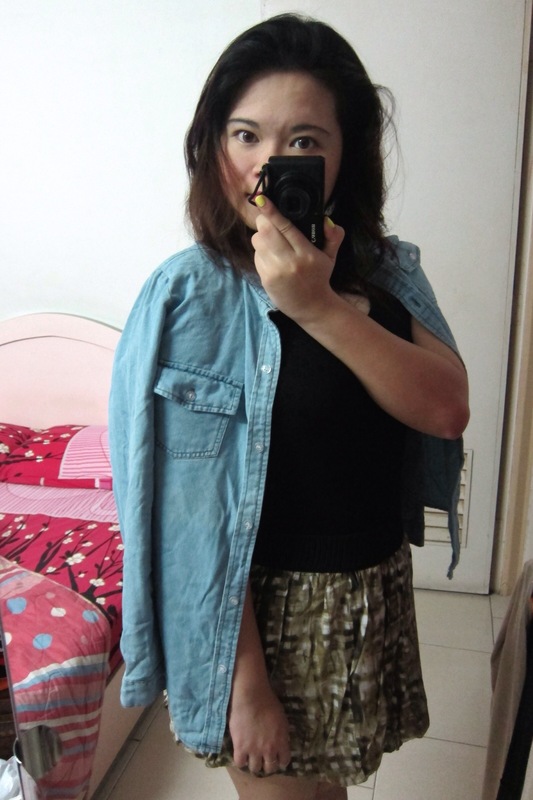 This chiffon long sleeve scarf blouse have got to be my favorite clothing piece from my loots! It’s light weighted which is perfect for Singapore’s humid weather and I like the attached scarf design. 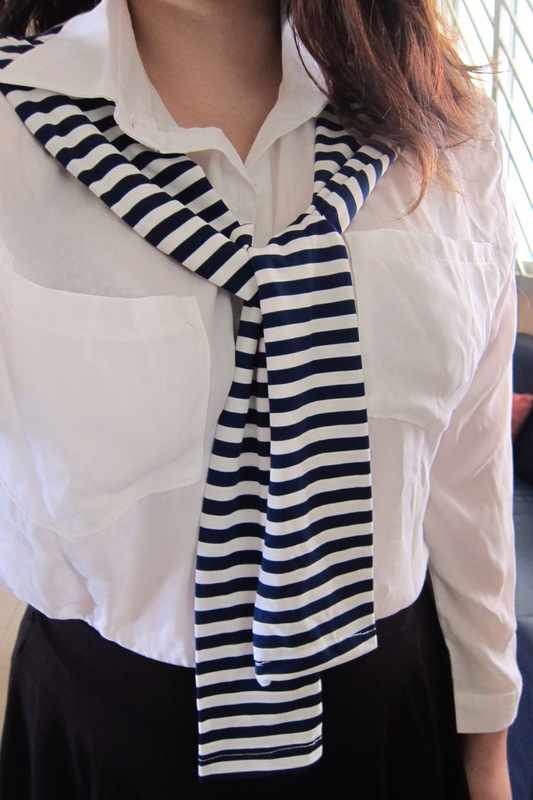 Paired it with a simple black skirt and it gives the preppy kind of look! 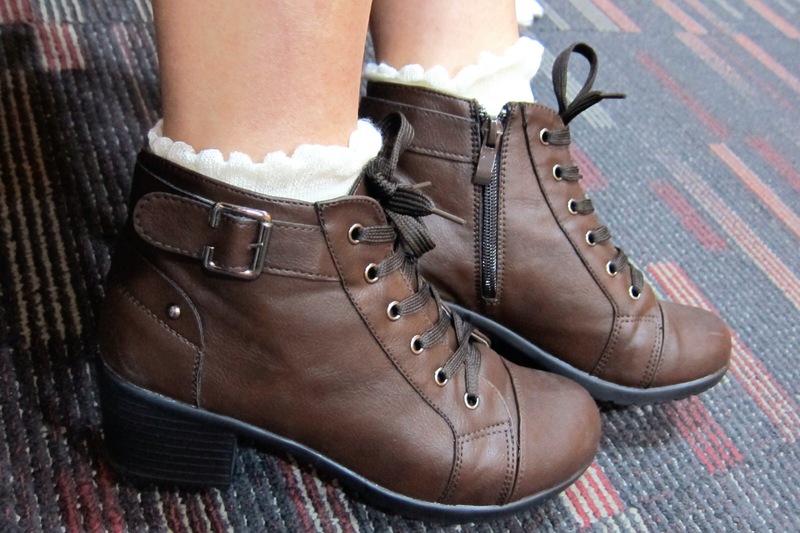 Best item from my loots have to be this pair of simple brown leather boots! And it’s only about 29 USD. It is really light which makes it very easy to walk in and very comfortable! I also love how versatile it is as it is suitable for many looks! 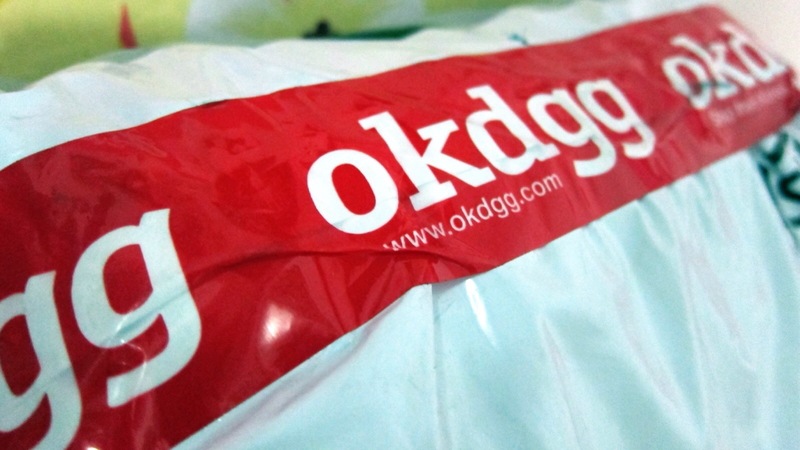 I enjoyed shopping on OKdgg.com and had a fuss free shopping experience on the site! Check it out yourself and shop away!! Here’s the look I created for the sixties themed Singapore Blog Awards two weeks ago! Bright retro top is from Scape and the scarf is from scape flea! And here’s my LOTD and recreation of the sixties look! How do you think I fare? Is this sixties enough? It’s had been so long since I last did a look book post. Have been lazy on dressing up and putting on makeup recently. 😛 I even gone bare faced now to work, unless I’ve an event after. Anyways, was out to the S.E.A Aquarium with the Cousins* last Saturday so I took the chance to dress up. 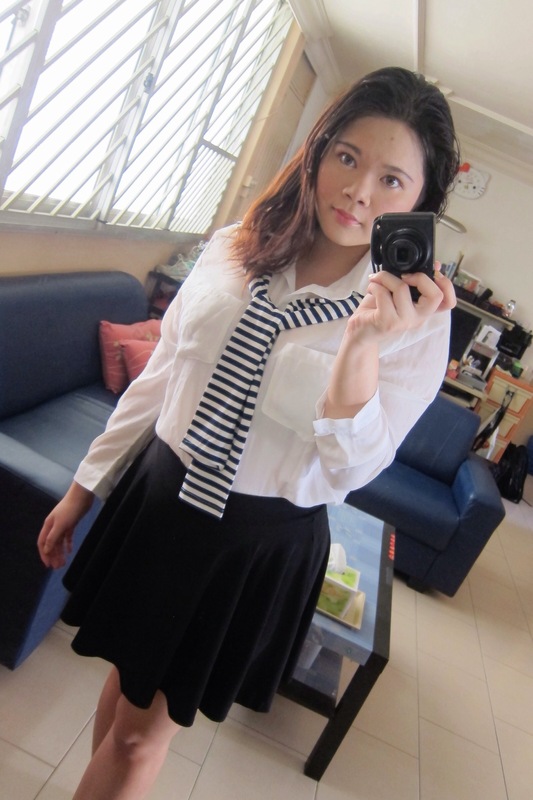 I name this the Girlish Preppy look. Here’s the make of the day. I opted for something more colorful, more cheery for the eyes and kept the rest simple. Here’s a closer look at the eye make, it’s a blend of light green, teal and lilac. I used a light shimmery cream shade to highlight the brow bone area. The light green on the inner eyelid, and the inner side of the lower lash line. The teal is on the outer corners. If you’re wondering where’s the lilac, I used it on the lower lash line and in between the green and teal as a blending color. When using colors, always remember to blend the colors together so it won’t look patchy! For the eye make, I’ve used 4 colors from my Sleek Mediterranean Palette L.E palette. I’ve also lined my eyes thinly with the Fantastic eyeliner in Secrete Khaki from Kick It Side for a little definition. Mascara wise, I’m using the DollyWink Volume Mascara. Primer wise, I’m using my HG NARS Eye Primer. For blush, I used Sleek Santorini Blush applied lightly, lips wise I used Rimmel London Lipstick and ZA lip gloss in a baby pink shade. Foundation wise I had on Bourjois Healthy Mix Serum Foundation, set with Urban Decay Razor Sharp HD powder. I’ve also used the YSL Touche Eclat for concealing and highlight. I like how the team at Praeimpact Studios works. The whole process starts with a consultation before the shoot, followed by the shoot then the selection of photos. It’s like Pre-Production –> Production –> Post Production process. 😛 Which is good as they will understand from you what kind of photos you wanted so as to try their best to deliver. Unlike studios where you just book a timing, then go there shoot and done. Ok, on to the photos now. 😛 These are my favorites out of all! I received 8 photos sponsored, bought 8 photos and got 2 complimentary which means 18 photos in total. You can see teeth in the photo below! Super rare I tell you! I seldom smile, and even if I do you can never see the teeth as it’s a tight smile like the one above. Here’s a photo of me pretending to look at leaves. 😛 Turns out super nice and dreamy! Below are the rates of the Photography Services by Praeimpact Studios! The shoot I did will be the first one shown. They have different kind of services, be it a individual shoot like what I did, to studio, events and even graduation shoot! Felt like taking photos for a special occasion? Or you just want a set of professionally taken photos for yourself? Now you know where to go! Check out Praeimpact Studios for more information!